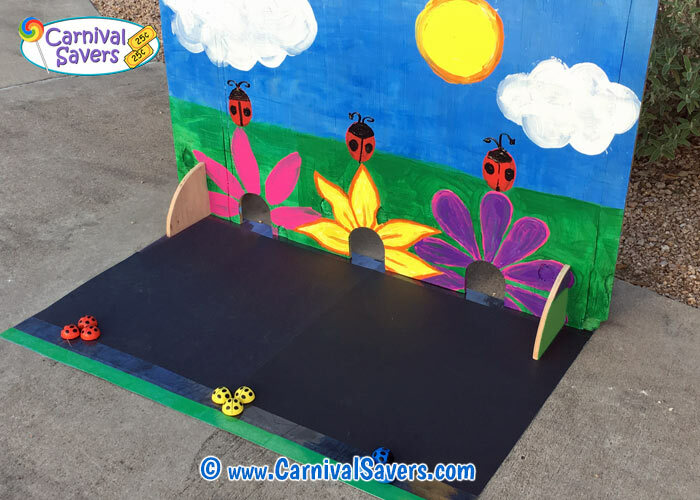 DIY Spring Fling Game - Ladybug Races! Kids Use 3 Pull Back Ladybug Toys. Closeup of wooden supports for game. Start by cutting your main board. At the bottom of the board, make 3 "mouse holes" for your ladybugs to go through. Next, on the bottom of the board about 4 inches in from each outside edge, cut two "notches" for your board supports. Your next step is to cut a circle about 13 inches in diameter and then cut your circle in half. In addition, you will need to cut a notch in each support to match your board for support. 1. Poster Board- This is the easiest method, but will not last as long as the smooth plywood option but works great indoors or on a gym floor! You will need to "seam together" your Poster Boards using your clear packing tape. This is best done inside and with two people to help keep the posters perfectly together while taping. Note: we cut a strip from a green Poster Board and added it using packing tape to our black poster board to act as a "starting line". Finally, use your packing tape and tape around all edges of the Race Track to prevent bending of the edges of your poster board. Note: if you have access to a large laminating machine, laminating each poster board and then seaming together would be ideal. 2. 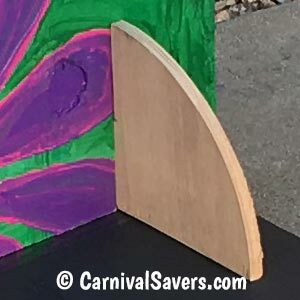 Smooth Plywood Board- This method is best for annual events as this will make a lasting Race Track! Cut your plywood to be about 4 feet in length. Sand the edges and the top thoroughly and paint as desired to be the Race Track for the ladybugs. Once this game is made, the setup is simple. Find a flat area on a walkway or indoors on the tile to set up this game. We suggest that you sweep off rocks, leaves and dirt from the general area. NOTE: Parking lots and streets can have very rough concrete, so we recommend a walkway or path for a smoother surface if you have a Poster Board Race Track - and of course, this game works great indoors on tile floors too! Next set up your board with the support and slide your seamed Poster Board "Race Track" under the game. Set out your Ticket Box, Carnival Sign and display your prizes and you are ready to play! 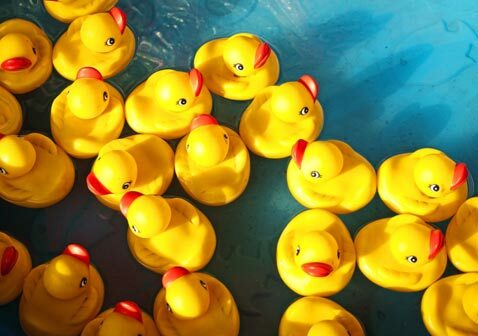 We recommend having at least 2 children (but ideally 3 children) to play this game each time. 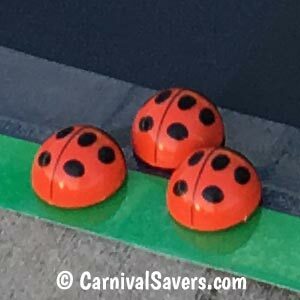 Children are given 3 Pull Back Ladybugs in the same color at the "starting line." The object of the game is to get as many of their Ladybugs through any opening in the board to the other side. So... this game is NOT won on speed, but on accuracy. The game volunteer tells the children the goal is to get as many of their ladybugs through any of the flowers to the other side as possible. If this is a game you intent to use year after year, you may wish to start out with the smooth plywood as the "Race Track"
Important Note for Fund Raising Carnivals - Because you will have a "winner" with most rounds on this game - we recommend choosing a "Medium priced" prize as you will need many to pass out during your carnival. Note: Most children under the age of 3 will have a little trouble pulling back the ladybugs and getting them to "go" so this game is best for children 4 and up. SPRING PRIZES for the LADYBUG RACES GAME!